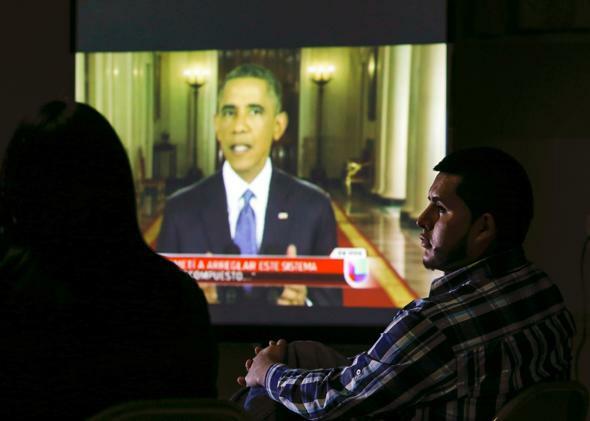 A group of legal and unauthorized immigrants watch President Obama speak about immigration policy from the White House, on a screen in New Brunswick, New Jersey, on Nov. 20, 2014. The president’s actions have their merits, but aren’t the best way forward. Whether you agree or disagree with President Obama’s use of his executive authority to temporarily shield 3.8 million unauthorized immigrants from the threat of deportation (on top of the 1.5 million he shielded in 2012), this much is true: The Obama administration has permanently altered the immigration debate. The president and his lawyers are right to insist that his executive action has not granted these immigrants “legal status.” Rather, it allows unauthorized immigrants to apply for a three-year reprieve from removal, which comes with a work permit. Though many conservatives, myself included, have questioned the wisdom of this unilateral action, the executive branch is very powerful in our constitutional scheme, and I don’t doubt that his actions will be vindicated by the courts. So no, I don’t intend to quibble over whether the president had the right to take this step. But I do want to discuss what happens next. Is that really true? It’s not obvious to me that impoverished people who choose to cross the border illegally, or to overstay their visas, are thinking first and foremost about contributing to America’s success. My guess is that most of them are keen to take advantage of the place premium, i.e., the fact that wages for the same work are much higher in a rich, productive country like the United States than in a poor, less productive one, like Nepal or Peru. I’d also guess that while these women and men are generally grateful for the opportunity to live and work in the United States, they care more about their own families, in the U.S. and abroad, than about some abstract American national community. (This is why remittances from immigrants toiling in rich countries to the relatives they’ve left behind in poor countries vastly outweigh the overseas development assistance handed out by stingy Western governments.) I don’t mean to suggest that immigrants are bad people. I just think that they’re ordinary, run-of-the-mill people—a mix of sinners and saints, like the rest of us, who care more about their kith and kin than perfect strangers. Regardless, the president’s rhetoric leaves the strong impression that he sees this reprieve as a stopgap measure that will pave the way for a permanent welcome to most of today’s unauthorized immigrant population. As Ramesh Ponnuru observes, Obama didn’t give us any principled reason why unauthorized immigrants who’ve been here for a while should stay while those who haven’t should go. But again, let’s leave that aside. The president’s intentions are clear: He wants to grant certain classes of unauthorized immigrants legal status and he doesn’t have the power to do so unilaterally, so he’s doing the next-best thing. Fair enough. There was something else the president left out of his announcement, though. As we bring large numbers of unauthorized immigrants in from the shadows, so to speak, we must confront a few important facts. Unauthorized immigrants are, with very few exceptions, heartbreakingly poor. They tend to have extremely low levels of educational attainment, and workers with limited skills have been taking a beating in the U.S. labor market for decades. All the available evidence suggests that giving unauthorized immigrants the legal right to work in the U.S. will increase their wages, but not by much. And the children of less-skilled immigrants tend to have poor educational and labor market outcomes—indeed, there is some evidence that is true for the grandchildren of less-skilled immigrants, too. Does this mean that I oppose bringing unauthorized immigrants in from the shadows? No, it does not. What it means is that I take that task very seriously, because I understand that granting unauthorized immigrants legal status—or, for now, temporary quasi-legal status—entails a generational challenge. Given the scale of this challenge, and the fact that today’s unauthorized less-skilled immigrants are vulnerable to economic competition from future less-skilled immigrants, we also ought to declare that enough is enough: This will be the last less-skilled wave that we will absorb for the indefinite future, and that this will also be the last amnesty. To demonstrate our seriousness on this front, we should take a step that countries like Australia, Britain, France, Ireland, and New Zealand have already taken: We should end automatic birthright citizenship. If it is wrong to tear families apart by deporting the parents of U.S. citizens—and it really is wrong, in case you were wondering—we ought to establish that only the children of those who are living in the United States as citizens or lawful permanent residents will be granted citizenship at birth. Instead of inviting future waves of unauthorized immigrants by, among other things, allowing birthright citizenship to stand, we should ensure that the less-skilled immigrants who already live among us don’t become part of a permanent American underclass. The only way to achieve this goal will be to commit vast resources to upgrading their skills and those of their children, and yes, that will almost certainly mean higher taxes. President Obama never discussed the taxes that you and I will have to pay to guarantee that today’s unauthorized immigrants will become full participants in our society, or the challenges they will face as the pace of automation accelerates and people with limited skills struggle to find their economic footing. He celebrated our immigrant heritage without addressing how the immigration slowdown of the 20th century helped earlier generations of immigrants climb the economic ladder. He told us a feel-good story that left out the hard work to come. And in that regard, he failed us all, immigrant and native alike.